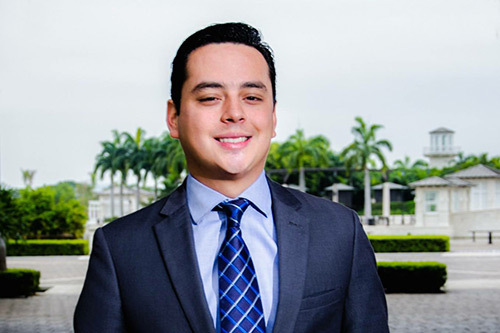 After completing a Specialist LLM in Maritime Law at The City Law School, Fabrizio is now a Partner at his own law firm in his native country Ecuador. Based in Guayaquil, Ecuador, Garcia & Asociados - Attorneys at law is a law firm specialiing in Maritime Law, Customs and Port litigation. I chose City for its international reputation, for its outstanding alumni and due to the fact that it is located in the heart of legal London, where everything happens. Furthermore, I chose it because it is one of the few universities across the UK and the world offering a high quality master course in Maritime Law, facilitated by prominent professors specialized in the area. Having completed my studies at City I feel it fulfilled my expectation of high quality education. I enjoyed studying in a city full of knowledge where you can find a vast amount of legal literature, in both private and public libraries. I just needed to focus on one particular problematic and the information was vast and easily accessible. City helped me to focus my research, guiding me into the "sea" of knowledge and literature that exists about maritime law. Marine Insurance. Due to the fact that the module is a mix between law historical facts, and how the history influenced the creation of the law, and daily legal practice. Maritime law revolves around insurable interests; therefore, if you understand how marine insurance works, you get a wide understanding of the entire maritime shipping industry. The overall highlight of my course was the helpful guidance through the vast legal literature on the topic. I am a partner at Garcia & Asociados - Attorneys at law, which specialises in Maritime Law, Customs and Port litigation. We focus on Maritime litigation in Ecuador and the Panamanian Maritime Courts.